Tom Crowe of CatholicVote.org, who was in seminary with Father Luke for one year, reprinted the letter on CV's blog; click here to read it. 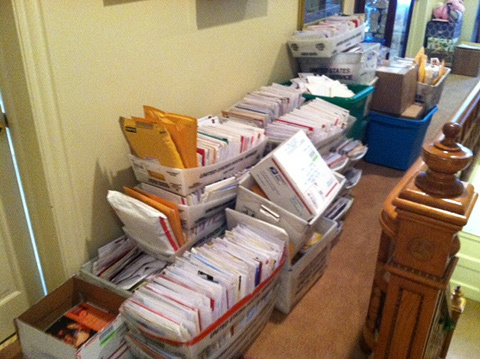 Below is a photo of some of the mail sent to Father Luke at the parish rectory. Suffice to say, the priests will be spending a lot of time opening it! The Hobby Lobby stores will defy a federal mandate requiring coverage of the morning-after pill in employees' health-insurance policies, risking fines of over $1 million a day beginning on January 1. Hobby Lobby, a Christian-owned retail chain, has challenged the HHS insurance mandate in court. Last week, Supreme Court Justice Sonia Sotomayor denied a request to block enforcement of the mandate until the lawsuit is resolved, but said that Hobby Lobby could pursue its case in lower courts. The chain has announced that it will defy the HHS mandate at least until the case is resolved. Now that's a courageous stance! God bless Hobby Lobby. In related developments, Korte & Luitjohan Contractors and Tom Monaghan have won temporary court victories against the HHS mandate. Click here and here to find out more about these cases.